An Act of God at the Blue Barn Theatre is more thought-provoking than funny, but then I’m a believer who found Book of Mormon sophomoric. It’s probably funniest to non-believers who think all believers believe literally every word in the Bible. And (I’m still guessing here) those most literal fundamentalists probably are offended by the lines that made me laugh out loud. For example, Ablan Roblin, the form God took for this occasion in Omaha, made it clear that he’s got nothing to do with wide receivers who point a finger skyward when they score a touchdown. While he doesn’t care who wins, now and then he influences the spread. They’ve done plays like The Christians which takes a serious, almost reverent look at a major challenge of Christian faith, and they did a Tracy Letts play about a Nebraskan wrestling meaningfully with his faith. But in the holy name of irreverence they traditionally mount a broadly satirical show to counter a surplus of holiday sweetness and light. And this time they’ve also prepared a post-show titled, “Interview with a Heathen…er, Humanist,” so the Blue Barn seems to take seriously what should be obvious to believers—that ethics and moral values exist outside of religious faith. Back to An Act of God: It’s a three-person 90-minute play, rescued from a monologue by two angels, Theresa Sindelar as Michael, who asks God some accusatory questions, and Raydell Cordell III as Gabriel, who aids God like a boxer’s corner man who mops the sweat from his brow between rounds. God continues to order mankind “not to take my name in vain.” Please don’t ask him to either bless or damn anyone, he exhorts. For believers not easily offended, it becomes more challenging when he talks about Jesus. But after making the point that Jesus lived a relatively normal life for the first 30 of his 33 years, author David Javerbaum lets God get a little more serious and supportive, though hardly enough to comfort those who’ll find the scenario offensive. This goes well beyond the depths of most doubters, but most of God’s foibles in this play are the sort that many Christians wrestle with. As Milton once wrote, “God gave man the gift of reason to be his own chooser.” I trust that this review gives you enough reasons to choose whether you’ll find it thought-provoking and occasionally funny or merely offensive. 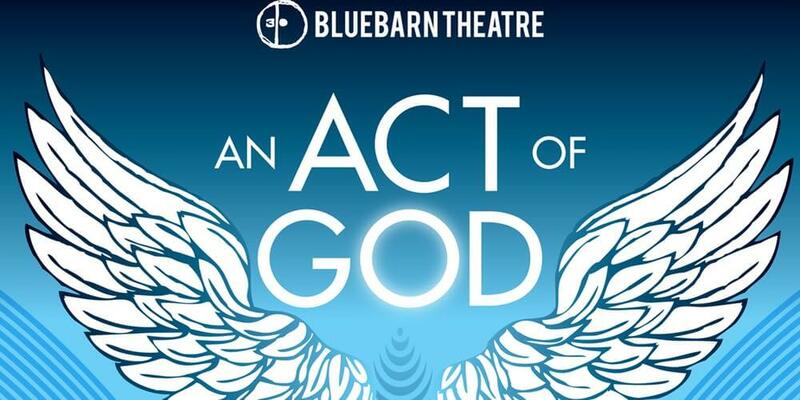 An Act of God runs through Dec. 16 at the Blue Barn Theatre, 1106 S. 10th St., 7:30 p.m. Thursdays thru Saturdays, 6 p.m. Sunday Dec. 5 and 12, 2 p.m.Dec. 16. Tickets are $35, $30 for seniors, with information at bluebarn.org or by calling 402.345.1576.